Ace Moloi proves that ambition and self-belief are key ingredients in achieving your dreams. 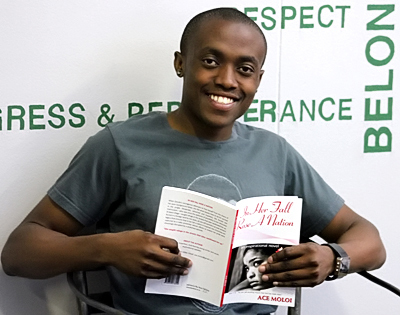 At merely 21-years of age, this Kovsie student made his entrance onto the literary scene with the launch of his first novel. In Her Fall Rose a Nation tells the story of a young girl who leaves her rural home to further her studies in the city. Loosing herself in the excitement of student life, she gets kicked out of university. As a result she has to find refuge in the streets that devour her last bit of hope of rising again. The novel, published by New Voices Publishing, was introduced to an eager audience at the Bloemfontein Campus. Moloi, a third-year Communications student and prime of House Tswelopele, says his book is a unique offering that will inspire and intrigue. The talented writer, who is also a content contributor for News24 and a former IRAWA Post news editor, says he has been influenced by the writings of extraordinary individuals such as Kwasi Koranteng, Steve Biko and Dr KPD Maphalla. It took him three years to write the book, Ace says, mentioning that it first started as a Sesotho novel, that was later turned into English. * In Her Fall Rose a Nation sells for R100 and can ordered from Ace at [email protected]. The book can also be ordered online for R150 from New Voice Publishing online bookstore at www.newvoices.co.za.